I never used to be a fan of pasta sauce. This is mainly because it was not a staple food at my parent’s house. The rare times we ever ate pasta, the sauce usually was store-bought. (Ragu–YUCK). It always gave us instant heartburn. When I went to college, my now husband, decided he wanted to make me dinner. I remember him going back and forth between his dorm room and the dorm communal kitchen, every now and then calling his mother, asking what to do next. A few hours later, he set our table with two big bowls, soda, Parmesan cheese, ricotta cheese, a pot of penne and a pot of sauce. From this meal, my love for Pasta sauce was born. I of course, immediately got the recipe and ever since, I have been making my own sauce. The first time I made the sauce for my family, they were amazed at the lack of heart and the wonderful flavor. My neighbor’s children loved it when I sent some to their home. I always tried to make extra for the freezer. It is rare that I will purchase pasta sauce now. It is under my “Emergency Only” list of items I would purchase. So tonight, I am making a pot of sauce. I have friends coming over tomorrow and I want to make a Lasagna for them. This sauce is very simple and easy to put together. 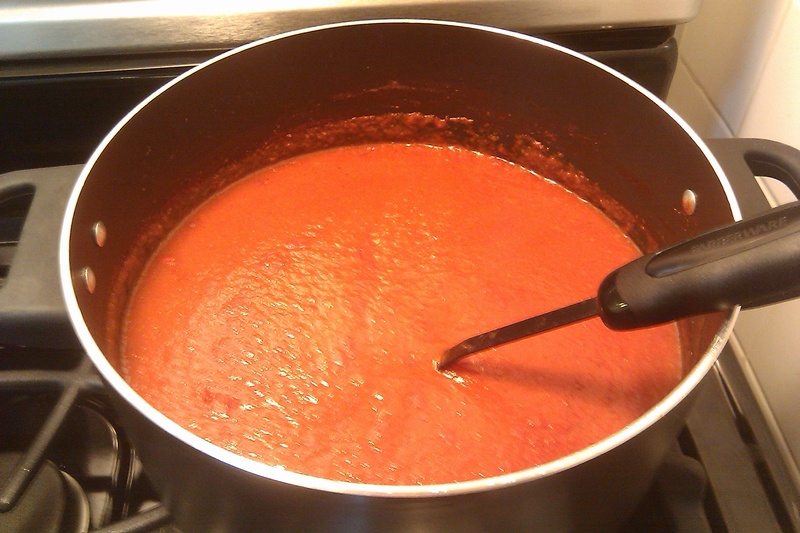 I like to cook it for a few hours, making the sauce thick. The recipe I have tonight, will be for the basic sauce, which you can add meats and/or vegetables for different types of pasta sauce. Saute onions and garlic in olive oil until the onions are translucent in a large pot. Pour the mixture back into the pot. Blend the remaining can of tomatoes with two cans worth of water (56 oz -) (If you are going to let to sauce cook for only 1 hour, use only 1 can worth of water. Add bay leaf and sugar. Allow sauce to simmer for 3-4 hours. Serve with penne, Parmesan cheese and ricotta or use in your favorite pasta recipe. If you are making a meat sauce, brown the meat and then add the pasta sauce to the same pot you browned the meat in (Get all the browned flavors to mix into the sauce) and let cook until flavors are combined. Pasta Sauce, Ready For Action! 🙂 I can’t wait to try your sauce!